Independence has been met with mixed reviews by fans and media. And most fans that I talk to prefer Independence over the Mountain West Conference. Those same fans admit that what they would really prefer is inclusion in a major Conference. They may disagree on what Conference whether it be the Big 12 Pac 12 or one of the others. Independence may remain the best option that the Cougars have, but the question I pose today is did the Pac 12 make the right choice in choosing Utah over BYU? And also who would do better as a member of the Pac 12? Utah has advantage in the rivalry game in recent years, but that advantage is not as big as many claim it to be. It is true that Utah has won 3 in a row, 4 of 5 and 8 of 11. But each of those streaks is directly preceded by a BYU streak. And it is also true that Utah has not beaten BYU outright in a decade since the 1960s. And it is true that BYU has not beaten Utah outright in a decade since the 1980s. And yes that means that the 1990s and the 2000s saw BYU and Utah tie 5-5 in both decades. The 0-3 hole BYU finds themselves in is not new when you consider that they had a 3 game losing streak in the 90s and a 4 game losing streak in the 00s but still tied each decade. The 2010s will prove to be more of a challenge being down 0-3 facing a hiatus and uncertainty of future games. (Update: Chris Hill officially announced games in 2017 and 2018 yesterday.) But that is why they play the games crazier things have happened than a 3 game BYU win streak over Utah. BYU and Utah played together in the MWC for 12 years total (1999-2010), and for 6 years (2005-2010) with their current head coaches. Here is how the Mendenhall coached Cougars and the Whittingham coached Utes did in 6 years of MWC play. As you can see under coach Mendenhall BYU won 4 more conference games in 6 years of MWC play than the Whittingham led Utes did. BYU and Utah played the exact same opponents each year and BYU won at an 8% higher rate than the Utes. Here are the breakdowns of BYU and Utah vs the Pac 10 and 12 schools since 2005. 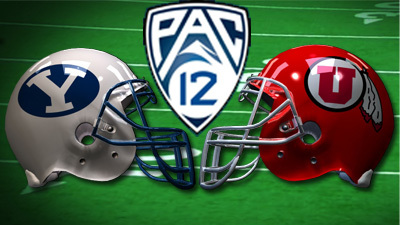 As a member of the Pac 12 for the past 2 years Utah has played more games vs the conference than BYU has. They have also had to deal with the “week in week out” schedule that goes along with it. And this definitely adds a certain degree of difficulty to the schedule. BYU on the other hand has had 2 of its Pac losses vs the Utes. Meaning that they have won 9 of 14 vs the other 11 teams. But the fact is that it took Utah 25 games to get to 11 wins. And it only took BYU 16 games to get to 9 wins. It is definitely possible that BYU would have a lower win percentage a member of the Pac 12. But I think it is safe to assume that BYU would be able to get another 3 victories in the next 9 games to continue the advantage. As stated earlier Utah has the 3 game advantage head to head. But BYU showed that they could win at a higher percentage while both teams were in the MWC. And have shown that they can beat Pac 12 teams at a higher rate as well. Many point out that Utah has a better track record vs the big opponents such as Alabama. BYU also has had big wins recently over Texas and other victories over Oklahoma, Oregon, Oregon St. and TCU. And on the flip side BYU has less likelihood to lose to the bottom dwelling teams such as Wyoming, UNLV and Colorado that have beaten the Utes during the Whittingham years. Who would do better as a member of the Pac 12? With the data and arguments shown above I am giving the edge to BYU. Would BYU be a better fit for the Pac 12 than Utah? Academically and Philosophically maybe not. But when you add the on the field data with the brand, fan base, stadium size, and Basketball program, then athletically I have to say yes BYU would be a more successful University in Pac 12 athletics than Utah has been, regardless of the three game losing streak to the Utes on the football field. You should probably look at the final year MRatings composite for each of the years. In the Bronco/Whitt era, BYU has the better average year-end rating. The problem is Bronco’s coaching in the Utah game. Relative to season average, BYU has underperformed vs. Utah, and Utah has overperformed. The last 2 years BYU has been the highest rated team that Utah has beat, Utah has been the lowest rated team we’ve lost to. Bronco is better as a consistent coach, Whit is more up and down. Whit works vs. BYU, but not when the Utes got shut out vs. UNLV. I think coaching and strategy has been the main reason we lost vs. VA and Utah. Why not go for it on 4th and 1 (both games?) Why not bring in some kind of trick play or temporary QB substitution to get the passing game going? Why not try a fake punt or kick in a huge game where you need to try everything to win? Why not get the ball to Adam Hine once in a while? We outgained both teams, but lost each game.